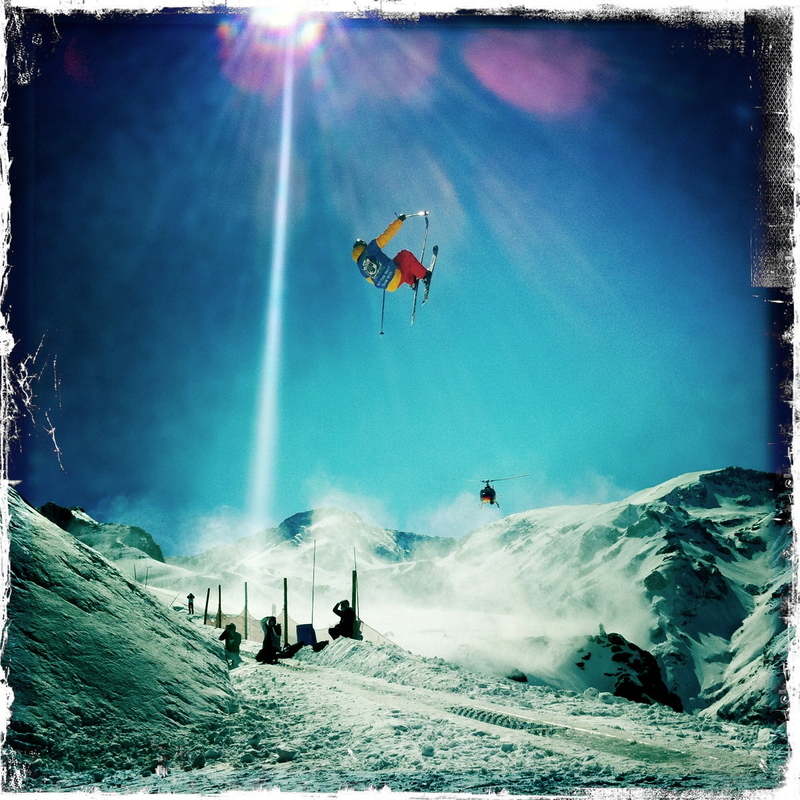 Henrik Windstedt throws some freaky freedog air in… a big-mountain contest in South America. The wait for snow and this season’s stunning slate of new ski movies—in particular the much-awaited documentary about Shane McConkey—have got me reflecting about how change in the sport is constant and inevitable for such a pursuit, but also how it occurs. That skiing is all about freedom seems self-evident, but that every epoch of skiing needs to break free of the last? Well, not so much. Storms are always descending on ski country, but the one that hit along North America’s west coast in the mid-nineties was all-time: a pair of powerful cyclones driven by the spiraling winds of two independent revolutions merged into the biggest gale skiing has ever known. When the storm settled, hallmarks of the previous epoch—carving-skis, FIS-governed events, snowboarding—found themselves sharing every inch of ground they’d claimed with a new and energetic ski culture: With remote mountain ranges and summer freestyle camps both spawning radical new ski designs and unheard of maneuvers, travel-heavy ski movies whose usual focus was on steep and deep began shifting to include artificial terrain parks and spare urban staircases. The most important event in skiing became the X Games, a well-funded competition that celebrated the cutting edge of a progressive freestyle movement unhindered by the rules and regulations of the FIS model it railed against. Once again it was cool to do whatever you wanted on skis. Everything was an experiment. The first shot over tradition’s bow was fired when pro skiers began descending big Alaska faces on “fat” skis, which, until then, were seen as crutches fit only for intermediates; their size and stability in a range of snow conditions opened up a whole new world of big-mountain skiing. The second shot came in the form of a new high-performance ski that, like a snowboard, had both upturned tip and upturned tail. This “twin-tip” spun more easily on snow and allowed skier to slide up and out of halfpipes, rotate, then re-enter without digging their tails in. Once skiers were playing in the terrain parks previously reserved only for snowboarders, the twin-tip followed the snowboard’s rail-grinding incursion into cities, mimicking the infrastructure-smacking revolt of skateboarders and in-line skaters. When this new energy inevitably flowed back to meet the purity of the big-mountain experience, the two storms merged: in melding the twin-tip with a fat-ski profile, big-mountain freeskiers and progressive freestylers came together. A new mindset and new equipment that jumped the barricades from terrain park to urban park, from backbowls to backcountry, brought a whole new look to skiing. Cornices and flutes were the new tabletops and quarterpipes. These days it’s all for one and one for all—even if there is a lot of specialization among skiers when it comes to Slopestyle, Superpipe and Big-mountain. But as seen in pretty much every movie released this fall, there’s no sign of anyone trying to break free of anything—they’re All In, and the revolution is still in full swing.